The Fayetteville Chamber encourages you to GET INVOLVED! Our Chamber has several active committees that meet throughout the year. These committees offer our members opportunties to contribute directly to the work of the Chamber and to interact with fellow Chamber members who share common interests. Committee participation is a great way for members to network, share ideas and build lasting professional relationships. *Note that these committees have special requirements or are by invitation only. 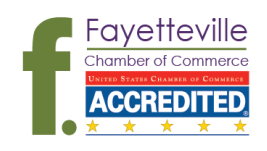 Leadership committees are limited to members that have graduated from the Leadership Fayetteville program. ** Note that not all committees meet monthly. Please contact the appropriate committee liaison to request the meeting schedule. If you are interested to learn more about our committees, or ways that you can be involved, please submit a request to us with the committee(s) in which you would like more information.